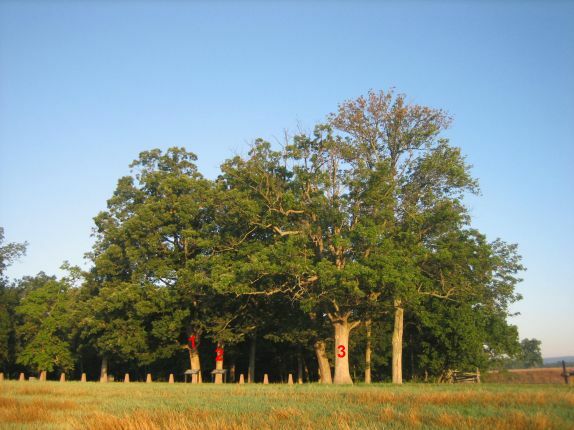 On the afternoon of July 3, 1863, 15,000 men of General George Pickett’s division sheltered behind McPherson’s Wood during the fiercest artillery bombardment of the war. Ninety minutes later, when the cannons fell silent, they passed through the wood and and marched over a mile of open ground to attack the Union center. As you stand beneath the boughs of the trees, and gaze at the stone wall marking the Union position, it is almost beyond imagining what those men were feeling as they formed their ranks. They were all veterans. They probably knew what would happen as well as their commander, General James Longstreet, who did his best to talk Robert E. Lee out of the attack. Lee would not budge. His men had repeatedly done the impossible; maybe they would do it again at Gettysburg. Where some of the generals wore plumes in their hats, talked of the bravery of southern manhood, and thought in terms of Napoleonic tactics, Longstreet was a pragmatist who knew that warfare had changed. He had already invented a new kind of trench, anticipating the tactics of WWI. He knew that bravery wouldn’t keep you alive when facing the fire of rifled muskets that were lethal at half a mile or when charging into cannons loaded with ball bearings. He told Lee that no 15,000 men ever assembled could take the ridge, but he was overruled. When Pickett asked, “Shall I go,” Longstreet could not even answer; all he could do was nod his head. In one of the most tragic events of the Civil War, the men of Pickett’s division formed their ranks and moved over the fields in lines the northern men found stunningly beautiful, even as they fired their cannons and blew them apart. Pickett’s 15,000 men suffered 60% casualties that afternoon. As the survivors staggered back to the woods, Lee met them. “It is all my fault,” he told the troops. “All my fault.” The south never had another chance to win the war. The only brigade to reach the wall was led by General Lewis “Lo” Armistead. His story illustrates the brother-against-brother tragedy of the Civil War. Armistead and Union General John Hancock were close friends during the Mexican War and later in California. On the night before they took separate trains to join opposing armies, they gathered with other officers to drink and sing and make tearful toasts to each other. Armistead said, “May God strike me dead if I ever lift a hand against you.” When he learned that he would have to march against Hancock, who commanded the Union center, Armistead did not think he would survive; he sent his family bible to Myra Hancock, his old friend’s wife. This clip from Gettysburg is one of the most moving of the film and represents one of the saddest events in American history. It is Armistead who gives the order to March. It is worth noting that this scene, like most in the movie, was filmed on the Gettysburg battlefield, with the help of thousands of Civil War re-enactors who bring tremendous realism into all of the scenes involving the armies. On the next day, July 4, the Confederates reformed their lines as driving rain fell. Lee hoped Meade would attack, mirroring his own mistake of the day before, but no attack came. That night, the southern troops left the field and started their march back to Virginia. Meade pursued the retreating Confederates, but half-heartedly, allowing the remnants of Lee’s army to escape. WIth vigorous action, he might have ended the war – instead it dragged on for another two years. This entry was posted in History, Movies, Novels, Travel and tagged Civil War, Gettysburg, history, movies, Novels, travel. Bookmark the permalink. The saddest page in the saddest chapter of our history. Armistead and Hancock are emblematic of the entire war and all its heartbreaking infamy and waste. Ah, Meade, you should have ended it sooner. Love American History. There’s just so much emotion to it, and this is one of the best examples. There’s always that underdog mentality, fighting for something more than belief and power. We seem to have lost that.